Whether you’re a deer hunter looking forward to this autumn’s harvest or someone who enjoys indoor target shooting, if you own a Remington rifle you’ll want to check out whether it is included in the recent recall. On April 11, the Remington Arms Company issued a voluntary nationwide recall of their Model 700 and Model Seven rifles equipped with the X-Mark Pro trigger that was manufactured between May 2006 and April 9, 2014. Their website gives detailed instructions for determining whether your gun is one of those recalled because it can accidentally discharge. 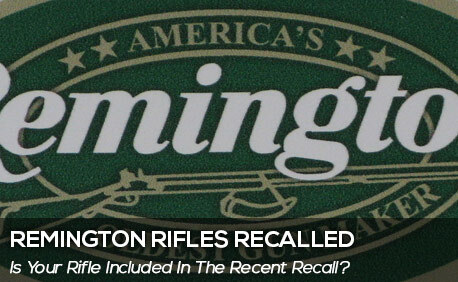 If you have one of the recalled Remington rifles, you’re certainly not alone. The Model 700 bolt-action rifles have been popular because of their accuracy and “smooth trigger,” with more than 5 million of them sold since 1962. The X-Mark Pro trigger on the recalled rifles can discharge when small amounts of rust, debris, or even a small jolt can cause the trigger connector to become misaligned. In some cases, rifles have discharged as the safety was moved to the off position to unload the gun or when the bolt was opened, closed or even just touched. We seem to be stuck on the topic of car seats lately, having written about regulation reforms and how-to’s. But a recent recall by Graco, one of the world’s largest manufacturers of car seats and other equipment for children, deserves attention since it affects a massive number of seats in which a child can become trapped due to a sticking latch mechanism. The National Highway Traffic Safety Administration (NHTSA) asked Graco to recall the car seats and booster seats out of a concern that children could be harmed when the quick-release button isn’t quick and, in fact, in some cases doesn’t release at all. Graco “voluntarily” recalled 3.7 million toddler seats but so far has declined to recall an additional 1.8 million infant seats found by NHTSA to “contain a defect related to motor vehicle safety,” i.e., a latch that impedes the quick removal of a child in an emergency situation. Graco says no injuries have resulted from the stubborn latches, even though desperate parents have reported having to cut the harness straps or call emergency personnel to extricate their child. NHTSA’s January 14 letter to Graco, however, mentions a pending California lawsuit that describes just the tragic situation NHTSA hopes to prevent. In that case, a two-year-old child was fastened into a Graco car seat and perished in a fire resulting from a car accident, allegedly because she could not be quickly removed. Here in South Carolina we’re blessed with moderate temperatures in November. That means the summertime burger grillin’ guys will be able to comfortably continue their outdoor cooking by frying the Thanksgiving turkey in one of those propane-fired deep-fat contraptions. 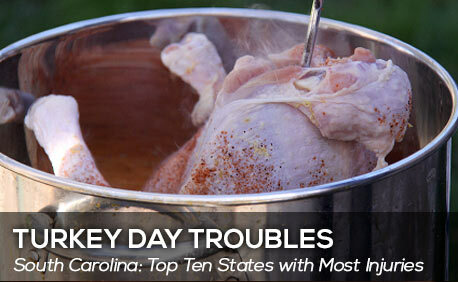 Maybe this is one reason South Carolina is in the top ten states with the most grease and cooking-related claims in November, according to State Farm data. Fried turkey connoisseurs say cooking a turkey in hot oil makes for juicy meat and crispy skin and takes only a fraction of the time needed for oven roasting. They also think it’s more fun. No one wants to receive a “Dear John” letter, but on October 22, 2013, thousands of animal doctors across the country received a “Dear Veterinarian” letter from the Food and Drug Administration (FDA). It asked the practitioners to help them solve the mystery of pet poisoning by jerky treats. For years, the FDA has received reports that some pets became ill after consuming jerky treats, and they have conducted laboratory investigations, without success, to determine the cause. The agency has already tested 1,200 samples without discovering the exact cause of any illnesses. And the number of reported illnesses is growing. 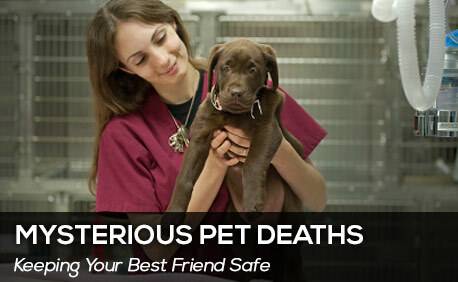 As of September 24, 2013, the FDA had been advised of 3,600 dogs and 10 cats who were sickened, apparently by the treats; 580 of these pets died. A New York State Department of Agriculture and Marketing study found low levels of antibiotic residues in some jerky pet treats, and several well-known brands were subsequently removed from the market in January 2013. The FDA is doing its own evaluation to determine the possibility that low levels of antibiotics can cause illness in dogs when fed over a length of time. But this is just one potential cause they are investigating. The U.S. Senate recently held hearings to consider the legal implications of the automated robot-driven cars being tested in three states — Nevada, California and Florida. Baja Inc., more commonly known as Baja Motorsports, has re-issued a recall of approximately 4,300 of its DR50 and DR70 dirt bikes. The recall was prompted by a defect in the fuel tank systems of the affected models, which can cause the bikes to leak fuel and is a potential fire hazard. The defect has already led to burn injuries among riders, according to recall information posted on the Baja Motorsports website. According to the company, consumers should stop using the affected dirt bikes immediately and contact Baja for free repairs. The recall officially began in March, but Baja Motorsports, based in Anderson, S.C., received reports of a significant amount of malfunctions and more consumer injuries after the recall notice had been announced–more than twice as many, according to a statement issued by the U.S. Consumer Product Safety Commission (CPSC). The original CPSC recall notice says that the recalled dirt bikes were sold exclusively at Pep Boys, between December 2010 and January 2011. The current CPSC notice, however, changes those dates to between December 2010 and January 2012 and no longer says the bikes were sold exclusively at Pep Boys. USA Today reports that the federal government has raised the number of deaths alleged to have resulted from runaway Toyota vehicles due to unintended acceleration to 89, which is an increase of 37 deaths from a previous update earlier this year. The USDA ordered a meat recall after an investigation revealed a disturbing story about the inhumane methods by which one of our nation’s slaughterhouses treats its animals. According to an Associated Press report, the U.S. Department of Agriculture ordered the recall of 143 million pounds of frozen beef from a California slaughterhouse which is the subject of an animal abuse investigation. Secretary of Agriculture, Ed Schafer, said that his department has evidence that the Chino based Westland/ Hallmark Meat Co. did not routinely contact its veterinarian when cattle became unable to walk after passing inspection, violating health regulations. Federal officials suspended operations at Westland/ Hallmark after an undercover Humane Society video surfaced showing crippled and sick animals being shoved with forklifts. Authorities said the video showed workers kicking, shocking and otherwise abusing “downer” animals that apparently were too sick or injured to walk into the slaughterhouse. Some animals had water forced down their throats, San Bernardino county prosecutor Michael Ramos said. Federal regulations call for keeping downed cattle out of the food supply because they might pose a higher risk of foodborne illness and contamination from E. coli, salmonella or mad cow disease because they typically wallow in feces and their immune systems often are weak. In response to the laundry list of unsafe toys and recalled children’s products in the past calendar year, the nation’s top two toy sellers in the U.S., Wal-Mart and Toys ‘R’ Us, have announced that they will be imposing stricter measures on their suppliers – including tougher lead content standards. According to an Associated Press report, the new measures are meant to exceed federal standards expected from Congress in the wake of last year’s recalls of millions of toys because they contained excessive amounts of lead or other hazardous material. * Setting a much tighter standard for the amount of lead allowed on surface paint for toys shipped to their chains on or after March 1. A top priority is to dramatically reduce the lead content in unsafe toys since lead can be very toxic to children. The current federal standard is 600 parts per million in surface coatings, but new legislation is being considered that would lower that to 90 parts per million. Both Wal-Mart and Toys R Us are requiring their suppliers to conform to the 90 parts per million standard for products shipped on or after March.